Booths are $30 per vendor per show. Two different size tables are available, starting with 6ft. This fee includes your tables and white linens. For more information, visit their website or contact their event coordinator, Jessica, at 214-364-6989 / Jessica@Dropvb.com. "Over 100 talented artists, crafters & designers will be selling hand-crafted items in a variety of categories. Raffle features items donated by each participating artisan and all proceeds benefit the Humane Society of Northeast Texas. The Humane Society of Northeast Texas will be on-hand facilitating pet adoptions throughout the event. " Applications are available here and are subject to a $10 application fee. Applications are due by February 11th, 2011. UPDATE 3/15/12 : They have a few spots remaining, get your apps in today! 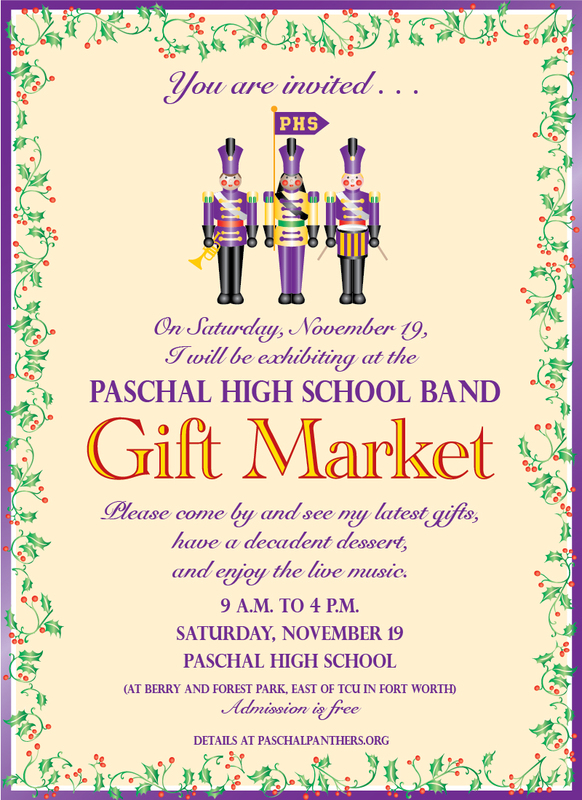 "On Saturday, November 19th, the Paschal Band will be hosting its 8th annual holdiay gift market in the halls of Paschal High School. Each year more than 60 vendors of quality jewelry, crafts, clothing and food items display their merchandise for sale to the public. There is entertainment throughout the day ranging from singers, instrumentalists and even a magician. 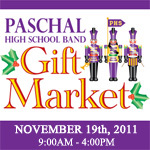 Come join the fun and get started on your Christmas shopping. The event will go from 9:00 to 4:00. " "Each year, Marketplace offers over 65 new and familiar vendors displaying toys, jewelry, unique items for home and holiday decor, and clothing. Favorite booths include: the Silent Auction, homemade baked goods from the Yum Yum Shop, the always-popular tamales from local missions, Marketplace Heavenly Blend coffee." Preview admission is by invitation only or $10 per person. 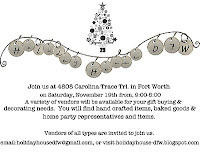 "Turning Pointe Dance Studio in Flower Mound, TX is hosting a Holiday Craft Fair! 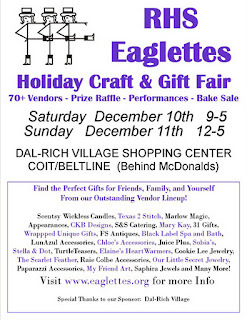 Shop wonderful crafts from local artisians, drink warm hot chocolate and enjoy delicious baked goods! Door prizes will be given every half hour. Get an early start on your Christmas shopping!" "Fall Festival at the Market will feature the distinctive work of many local craftsmen and women. 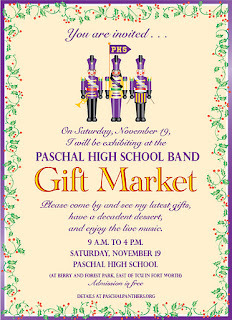 Free Admission and one of a kind affordable gifts. Weather Permitting." "Tons of handmade shopping fun! 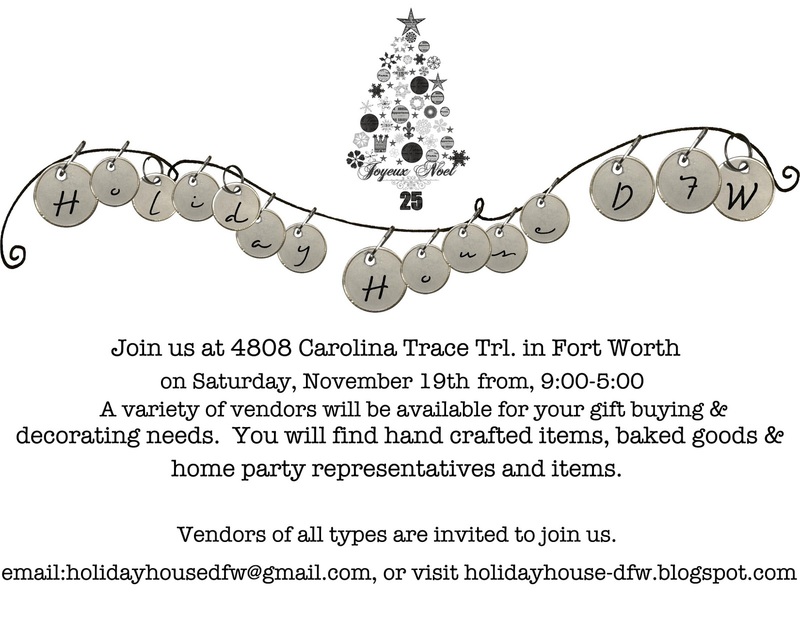 With additional shopping space this year, you can shop from over 60 handpicked artists from Dallas and beyond!" "Come check it out! Craft fair full of handmade items, a really great stop for any craft lover." Tables will be set up in the front parking lot unless there is inclement weather. Applications are available here and are due by November 26th, 2011. For more information, contact their event coordinator at cynthia.johnson@chisd.net. Applications are available here and are due by November 13th, 2011. For more information, visit their website or contact their event coordinator, Joe Bruner (owner of the DAFM), at 817-633-2332 / jbacpa@tx.rr.com. Applications are available here and are due by November 25th, 2011. For more information, contact their event coordinator, Delore, at delorejones@yahoo.com. 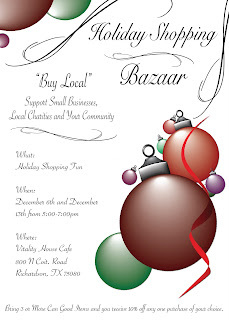 "The MacArthur Orchestra Boosters is sponsoring a craft show for the MacArthur High School Orchestra in Irving, TX. We are looking for vendors who would like to be a part of this show. Please go to the event website and read all pages before filling out the application. We would love to hear from you." Chairs are provided. Tables may be rented. Electricity is limited for an extra fee. Applications are available here and are due by March 16th, 2012. For more information, visit their website or contact their event coordinator, Denise at 682-503-6003 / neesee01@yahoo.com.